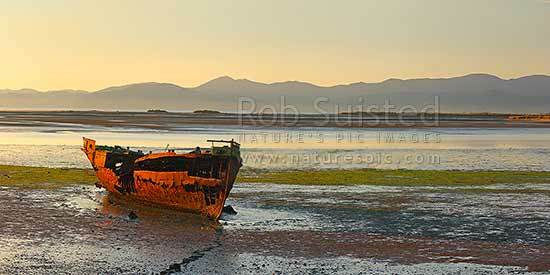 Wreck of the Jaine Seddon on Motueka foreshore. As an Examination Vessel for Wellington Harbour during the World Wars it's said she fired the first shots of the WWII. Panorama, Motueka, Tasman District, Tasman Region, New Zealand (NZ), stock photo.